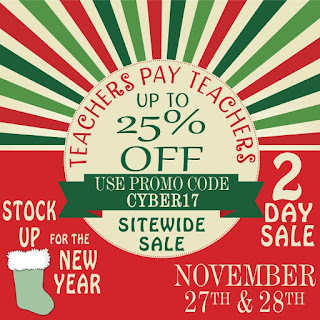 The annual Teachers Pay Teachers Cyber Savings Sale will be held on Monday and Tuesday November 27 & 28. Of course, I will be participating and putting everything in my store on sale both days. By using the Promo Code at Checkout, you will be receiving a 25 percent discount during this sale event. You can check out the site and save anything you like in your basket, then on Monday or Tuesday move your items to the checkout.